For some reason I had a really hard time finding and watching this movie. The first time I had it, it unfortunately had french subtitles and I didn’t feel like forcing myself watch it as such. Weeks passed and I took the quest upon myself, finding it eventually online at this here. The film focuses on a weekend trip out to the beach. Three families, a recently divorced man who has just returned from Germany and a daughters kindergarten teacher (Elly) are the main set of characters. They are excited and set for 3 days of relaxing. They arrive at their usual cottage, only to know that the owners of it are using it for the weekend. They agree to take a run-down, grimy one to replace their lack of shelter for the weekend. It’s right on the beach. It’s neat to see that their are aspects of modern western culture with the first couple scenes down by beach (playing volleyball for instance) but then you are reminded how different we are when they agree to separate the woman and children in one room and the men in the other for sleeping arrangements. I’m not saying it’s a bad thing, but it’s good to be reminded. Sepideh, the one who brought Elly for the weekend trip, had alternative match making plans. She plans to introduce her to Ahmad (the recently divorced man). She lied to the group woman in charge that they’re married (because of law forbidding unmarried couples to travel together in Iran). Later in the movie we find out that she had lied about a couple other things. (OH nooo; drama). Problems then arise on the second day when Elly has planned to go home. She’s lied to her mother about being with colleagues and needs to get back a.s.a.p. She’s trying to be the good girl here, but Sipedeh is making it difficult. Of course, Sepideh can’t have this. She still has been planning for Admed to impress Elly and it can’t end so soon. She hides Elly’s bag in a cupboard, and gives the job of looking after the children while the rest of the women go into town. The children are near the water and Elly is flying a kite. The scenes leading up to the major drama is Elly flying a kite. It ends just right there. The films considered a disturbing-edgy drama. I don’t really know why they consider it disturbing (there wasn’t anything too crazy), but it was like an intense mystery. Obviously at the end of the movie, you’re left wondering what happened, but more of in a “hmm, oh well” sort of way. I mean, if that makes any sense. I recommend this movie on a cultural level, but if you’re looking for an intense-edgy drama- no way. 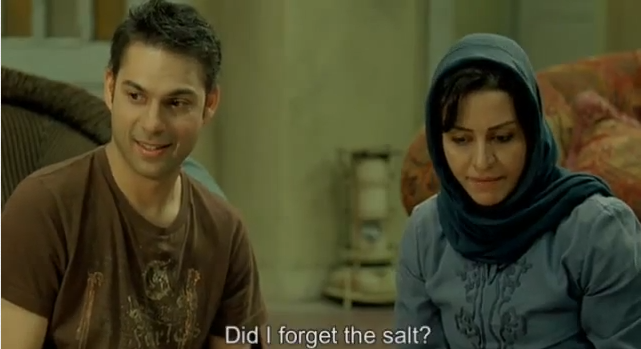 Fun fact, the actress who plays Sepideh (Golshifteh Farahani) also plays the main lady in “The Patience Stone“.